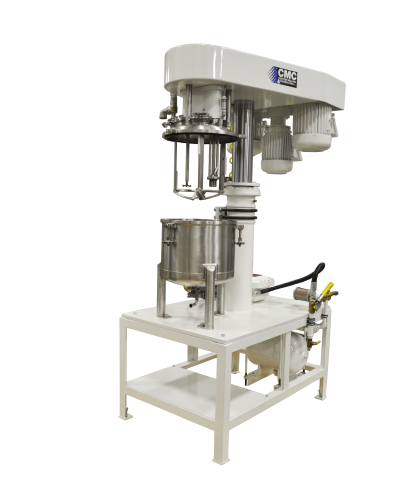 CMC manufactures a range of multi-shaft, tri-shaft, and dual-shaft mixers designed to mix and blend high viscosity materials together to form homogeneous blends. Our mixers are equipped with a low speed sweep blade that scrapes the tank wall and directs product flow towards the high speed element. It is designed with wetted stainless steel parts for long lasting durability. 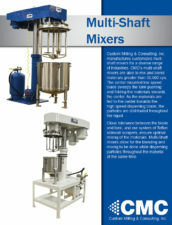 Multi-shaft mixers are used to mix medium to high-viscosity or poor-flowing materials. The close tolerance between the low-speed sweeping blade and tank make it possible to blend the higher viscosity materials. The high-speed blade will reduce particles, disperse them throughout the material and blend them all together. Variable speed control provides flexibility and allows our multi-shaft mixers to process a variety of applications.